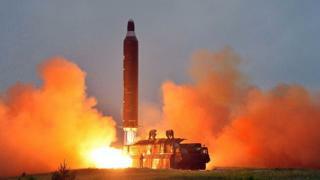 North Korea has conducted an unsuccessful launch of an intermediate-range missile, according to the South Korean military. This is the second failed test in less than a week after the North's recent launch of a Musudan missile, which has an estimated range of 4,000km (2,500 miles). It is said to be capable of hitting US bases as far away as Guam. The missile has been tested eight times this year, with only one success. However, experts fear it could become operational as early as next year. The US condemned the launch, calling it a "further provocation". Pyongyang's last test was denounced by the UN, which has banned it from any use of ballistic or nuclear technology.